"The point is that if consumers cut their spending, and nothing else takes the place of that spending, the economy will slide into a recession, reducing everyone’s income." In other words, Dr. Krugman buys the conventional wisdom from the closed-system model of economics. As I have pointed out, not every economist buys that per capita GDP represents or indicates income. Herman Daly, among others, points out the fallacies of using GDP for any meaningful measure of income. As long as values are denominated in dollars, no one can say what the status of income really is! As long as the dollar denominated GDP includes numbers that should be subtracted rather than added (e.g., defense spending) you will never have a clear understanding of what real income is. Aside from the fact that growth is actually not a good thing — it is killing our world — the fact that it is the thing being touted as showing the health of the economy (and presumably the society) is perverse in the extreme. This is what scares me on this Halloween night! Why don't people examine their own assumptions? Why does everyone just accept something as being self-evident when it isn't evident at all? In my prior blog I looked at the notion of what jobs really contribute to social good and which ones don't. By that criteria it should be obvious that consuming stuff just for the sake of creating jobs that do not contribute to social good should be seen as an evil not as a good. And, as I have indicated above, it is all predicated on a lie we continue to tell ourselves. GDP does not represent good. It is a phony number that politicians in power juggle around so that it sounds good. I'd sooner believe in ghosts and fairies than government numbers these days. Personal and national thrift are the virtues (read Krugman's article) that we need to re-establish. Savings are required before you can either insure against future disasters or borrow a bit of for new ventures (honest capitalism). Our grandfathers understood this. How did we forget? Hmm. That is a good question! The month of October has been a real roller coaster ride. I just realized I have gone the whole month without an installment in this series. Between the campaign, the financial crisis, the stock market volatility, and a continuing stream of bad news from oil production and global warming, it has been distracting. This week alone I heard the word 'historic' used in at least five different contexts in the above topics. Everything happening now seems to be historic! But before the month is up I want to get back to thinking about the future. This series of posts regarding the implications of what moving to what I call a sapient governance might be needs to continue as we think more about what needs to be done in the future. After all, it may be that that future gets here sooner than anticipated. One of the implications that I have touched on lightly in prior postings is what kind of work we will be doing in the future. How will we value human labor and thought? How will people make a living and pay for the things they need but can't produce for themselves? Clearly an economy in which people trade goods and services for some kind of money will be needed. But how will people earn that money? The real question boils down to what are the goods and services society will need in order to sustain both a reasonable living standard and an Ecos in balance? If you have followed my earlier writings about energy and its relationship to the economy, and about the definition of useful work, then you might anticipate where this is going. Anything that doesn't fit into one of these three categories is suspect in terms of its usefulness to society. For example, building luxury yachts is probably not doing anyone any good, except the pride of the rich owner. Oh sure, the work provides jobs for a few people. They can then buy the goods they need and so on. But how does society or the Ecos gain from this? Useful work, by my definition, is any work that is regenerative and enables the steady flow of energy through the social fabric. In the world I suspect we will soon be living in, any work that doesn't fit this criterion will be wasteful and entropic. Let me distinguish between work and skills. The former refers to specific jobs; how you deploy your skills and knowledge. A person with a set of skills and knowledge can apply those to either entropic jobs (designing and building yachts) or to regenerative jobs (designing and building more efficient transportation systems). Some of you may be quick to point out that I am making a value judgment about the 'goodness' of types of jobs. And you are absolutely right. But also note that it is a value based on a non-arbitrary requirement for life — namely the sustained flow of energy needed for a viable economy. Jobs that produce things that only allow the consumption of energy without producing energy are a drag on the sustainability of the economy as a whole. And this will be more evident (and painfully so) in a world with a fixed steady-state supply of renewable energy, such as a solar/geothermal/tidal based economy. The current economic crisis, which I expect will worsen and, frankly, not ever get better judged by the criteria of business as usual (you know, the attitudes and actions that got us into this predicament in the first place), might better be viewed as an opportunity rather than a depression. I say this because many people are soon to face layoffs and loss of income under the standard system. Most of these people think of their skills as being strictly job related rather than transferable. This is an unfortunate attitude since most such skills are immanently transferable — but that is another story. Two sapient things need to happen (though, having concluded that we are not very sapient, they probably wont.) The first is that the governance body has to identify and breakdown all regenerative work, things like building a national electrified train system, building a smart grid, turning to organic permaculture, etc. They need to determine categories of work based on how our energy use and production will be improved. They then need to work with managers who are willing to shift their skills to managing these sorts of projects. This will, no doubt, require considerable training, especially on the goals of energy management. Then these non-capitalistic organizations can hire labor and with rational financing begin to regenerate those aspects of the infrastructure needed for a future society. The second thing that needs to happen is that our education system has to make a tremendous shift to help educate everyone about the energy-based economy. Forget about training rocket scientists for a time. We will not be going anywhere off this planet anytime soon. We need just enough people, and the very brightest people who have an inherent interest in the subjects, to keep the sciences alive and operating. We are not going to make every student a scientist, nor should we. They do need the fundamentals of systems science, as I have argued. That provides them with a framework for thinking and solving problems. But they do not need to all be biologists or mathematicians. The education system has to turn its attention to reality and how to prepare people to meet it. Of course, as with governance, since I have already noted that our educators are no wiser than the population as a whole, this is very unlikely to happen either. So what will happen? In all likelihood, our leaders in government and education (as well as everybody else) will simply continue to try and apply the old rules and stick to the desire to grow the economy. Companies will continue to seek profits, educators will continue to focus on getting people ready for jobs (regardless of the worth of those jobs), government will continue to fudge statistics so as to make everyone think everything is OK. But all hell will break loose anyway. And then we will be talking about salvage, not saving. Meanwhile, consider your own trade. What do you do for a living? Does your work contribute more energy to the world? Does it help others save energy? Does it contribute to mental wellness so that others can do their jobs more productively? If your job basically simply provides luxuries or over-the-top entertainments, then you might want to consider how your skills and knowledge could do better. This is where we will all be in a few years. Most will be concerned with basic energy supply (food). Most will be just trying to eek out a living. But for those who recognize the fundamental value of energy flow, and have thought ahead how they can service that flow, they will probably do OK.
Let's assume the best outcome of the election — Obama is elected president. Then what? Clearly the economy will be his top priority. But what that means to all the 'traditional' thinkers in Washington and on Obama's team is getting the economy growing again. And by my reckoning that is actually not a good thing for the world and the long run. As I've pointed out it is the growth economy that is killing us even while we think it is our salvation. Mankind has already exceeded its realistic presence on this planet. It was only possible because of our discovery of easily obtained energy available to do useful work — the fossil fuels. We have expanded our economic activity without any foresight or planning. We have thus expanded our numbers without regard. We have collectively scoffed at Malthus and ignored Adam Smith's most cogent message about the moral aspects of economics, something Alan Greenspan recently realized to his surprise. And here we sit, sensing that we are deeply in trouble, indeed starting to expect the worst since none of our economic geniuses can tell us where this financial melt-down is going. And all anyone can think of is getting the economy growing again. If my hypothesis about the flow of energy being diminished such that we will actually never recover in any meaningful way is correct, then all of the struggles that will ensue to get things growing like the old days will be wasted effort, waste precious energy, and only result in making things worse, not better. In point of fact this economic slump could be an opportunity for humanity to get its priorities straight. And the USA needs to do the most getting straight. If Obama is honest and capable of grasping what is really going on in the economy he will tell the American people that it is time to grow up, stop thinking you are entitled to an on-going party of consumption, and start directing resources to what needs to be done. This isn't going to be painless. People will be strapped over the next several decades. But it is the price we pay for thinking we could have our cake and eat it too. We have been ignorant and definitely not wise to have squandered our wealth on playthings and luxuries and fast foods. We have been delusional to believe that we should be able to eat tomatoes year round by shipping them thousands of miles. We were out and out selfish to think that we had every right to become fabulously wealthy when people in other nations were starving. Obama has to tell Americans that the party is over. And he has to lead the American people to a new understanding of what it means to live within your means. To be sure he will not be particularly popular. The vast majority of Americans have grown up believing in American exceptionalism and the so-called American dream. We don't give up delusions easily. But trying to 'fix' things with band aids, as is currently being done by Paulson, Bernanke and the Congress, will only end up deepening the depression. Obama must turn to the people who have actually understood these problems for a while now. The need right now is for the federal government to fund research and development of the energy infrastructure (without clean coal thank you) and put a lot into conservation and reduction of discretionary spending. The president will need to reorient people's thinking from being consumers to being savers. He should begin to hammer away at the message that we have to be frugal from here on out if we are going to leave anything worthwhile to our children. He should also not be afraid to tell the truth about how the future will be paid for. The simple fact is that we the people will have to start ponying up to fund the salvage operation to come. He will need to make sure the government spends wisely on a variety of energy projects but he should make it clear to the American citizens that their attitudes about taxes have been childish and selfish. No one wants to pay to line someone else's pocket, or see money wasted on needless defense spending (BTW: the need for defense spending is likely to go down simply because no one else will be able to pay for mounting a serious threat in the not-too-distant future). But given extraordinary efforts to budget wisely and oversee spending carefully, we citizens had better begin to be willing to pay our fair share. And this will mean paying according to ability. Sorry rich folk. We are all in this lifeboat together. No one is going to be able to pull rank or have special privileges. Not unless they want to risk a real class war — one with bloody consequences. The average person is really angry now. They have played by the rules (foisted on them by the rich guys) and had expected to taste a little of that wealth themselves. Now they are beginning to realize that it was all a clever scheme to keep them down and funnel wealth to the already wealthy. The bail-out/rescue, or whatever the bankers and Wall Streeters are calling it, is an attempt to keep the rich guys rich and keep the plebes from rioting. But it won't work. Jobs are already being lost and it will only get worse. So the formula is pretty simple in one sense. Tax the wealthy (I prefer a progressive sales tax with a carbon and luxury surcharge) to fund jobs on infrastructure building. The middle class, what is left of them, should also expect to pay for much of this work. Whatever money is left in the system after the credit bubble completely deflates better represents energy available to do useful work. It needs to be put to doing truly useful work which means increasing our renewable inputs and diminishing our wastage. Put people to work retrofitting buildings with better insulation. Put people to work rebuilding soils and organic farming. Put people to work building solar thermal electric generation and the smart grid. If people lose their jobs building TV sets, put them to work building computer controls for the grid. Something akin to the World War II industry conversion effort is what is needed. Get people out of selling insurance and into collecting data on human welfare. Train people for nursing and medical adjunct jobs. But in another sense, of course, it is not so simple. The fundamental problem is one of educating people about reality. They will get it when the whole society collapses into chaos, but that will be too late. Yet without some major catastrophic event (and it appears the crash of the stock market won't do it) people just don't want to listen. They won't take action and close the door until after the horse is out of the barn. So Obama's job is going to be really, really hard. I don't envy him. If I have to guess, though, it would be that Obama won't do these things as soon as he takes office. He still believes in the American dream himself. My hope is that he is a fast learner and quick to see the writing on the wall when things he and his conventional thinking people try just don't do the job. If we are lucky, he will soon see that the conventional wisdom is really conventional foolishness and he will eventually start thinking creatively. I hope he will be able to see that there are people who have thought this thing through and turn to them for advice (like the advisory board folk I mentioned in the last blog). I haven't yet seen any evidence of a wise Obama. He is plenty smart, no argument there. But the very fact that he brashly entered the primaries with so little national-level experience doesn't suggest a great deal of wisdom. Of course, being extra sapient and being wise don't always correlate at his age. He may have the capacity to become wise if his brain is wired the right way (sapient). But without the life experience that produces the tacit knowledge needed for real wisdom, it remains to be seen if his judgment really is superior. I wonder, do we have time for him to mature? If I were in Obama's shoes, what would I do NOW? These are global, substantial, and interrelated problems that are developing at rates that would have been unimaginable even just a year ago, just before I started this blog. Nothing like this, even the world wars and the great depression, has ever faced humanity. Most of the problems are the result of our own actions. And, sadly, our leaders don't really know what to do. Right now it looks like Obama will win the election. The better of two possibilities is still not showing much savvy about the totality of these problems. If he believes that there is a chance for clean coal, or that raising taxes on the rich are the solutions, he really doesn't have a grasp as yet. Don't get me wrong, I think Obama is a very smart guy. I suspect he would be able to understand if he is getting the right information. As to whether that is happening still remains an open question. The stump speeches provide no evidence to support a positive answer. But it isn't fair to criticize without some kind of suggestions about how to fix the deficiencies. So here goes. If I were in Obama's shoes I would be setting up an advisory board of some of the world's (not just the US's) most knowledgeable people on these problems. And by knowledgeable I mean scientists with broad and deep understanding of how the world works. Here is my list of people I believe would contribute positively to advising him (me) on how these problems interrelate and how to start corrective actions as soon as he (I) take office. James Hansen leads the list here. He has shown a willingness to take political stands, especially on the issue of coal as the highest CO2 source. He also has started showing an interest in the energy issues. There are a number of people who understand population pressures and the ecosystem damages suffered under large populations. Paul and Anne Ehrlich would be the people I would go to to address population growth and how it impacts everything else. My friend Ken Smail at Kenyon College has written a great deal about humane population reduction strategies. Whoever is providing guidance on energy issues must have a grounding in physics of energy. I would go to David Goodstein at Caltech ("Out of Gas"). But I would also include the oil geologist Ken Deffeyes ("Beyond Oil") for his understanding of Peak Oil. Since energy issues have many faces I would include Matt Simmons ("Twilight in the Desert"), who is an investment banker, so understands the financial side of energy and Robert Heinberg (several books, "Power Down" maybe the most useful) who has studied peak oil and social/economic consequences for years. Vaclav Smil ("Global Catastrophes and Trends: The Next Fifty Years"), a Canadian(!) has produced some of the most comprehensive work on energy in society that I am aware of. I don't agree with some of his conclusions regarding the standardization of money with energy units (but then you have to have the ability to hear competing ideas!) but he is one of the most knowledgeable people around when it comes to energy. He has done considerable work regarding alternative energy sources. You need biologists, climatologists, geologists — you name it! But one person that could act as a focal point for integrating information about climate change is Australian Tim Flannery ("The Weather Makers"). He is a naturalist's naturalist with his fingers on the pulse of the planet. Gustav Speth, Dean of the School of Forestry and Environmental Sciences at Yale ("Red Sky at Morning" and "The Bridge at the Edge of the World") has a very broad perspective and knows all of the people in the climate change community. I actually have a long list of people in psychology and neurobiology that might be tapped for this, but at the top of my list is Howard Gardner (many books and "Multiple Intellegences&quout; fame). He is one of most holistic thinking people I've read when it comes to human nature. But I would also love to hear from Robert Sternberg (I've mentioned his work in wisdom research many times) and Michael Gazzaniga ("The Ethical Brain" and "Human: The Science Behind What Makes Us Unique"). Paul Ehrlich has tackled this area as well. Herman Daly, Robert Costanza, Cutler Cleveland, and Charles Hall (who I just wrote about) are all involved in ecological or biophysical economics which is a much more comprehensive view of how the economy needs to work in order to provide sustainable wealth production. As you might gather, if you have read some of my previous work, there are a number of people who come to mind in this area. These people are essentially the integrators. The folk who are able to talk multiple technical languages and bring disparate fields together for dialogue. One of my most treasured sources for systems thinking has been Fritjof Capra ("The Web of Life", but many more great books). so many of the other people I have named are truly systems thinkers so they should be able to communicate beautifully even when they disagree on points. But Fritjof is a systems scientist's systems scientist! Wisdom abounds in his views. One of my all time heroes is E.O. Wilson at Harvard. I've mentioned before that I think he is one of the wisest human beings I have read. I'd actually opt for a co-chair with another biologist, Lynn Margulis, University of Massachusetts Amherst. Professor Margulis is the originator of the endosymbiotic theory of how complex eukaryotic cells were formed (organelle such as the mitochondria were once free-living organisms that took up residence in newly emerging nucleated cells). In general I think biologists have the broadest possible perspective on the world and nature, including humans. And both of these individuals have demonstrated deep wisdom about life in general. There are many others that I would ask to participate in a part-time capacity or on an as-needed basis. I've dropped a few names around in previous blogs. But the real point is that the problems facing humanity need to be understood scientifically, including how humans are going to react to them. Politics and governance now have to have a very strong grasp on the real nature of the world, not some ideological understanding that in most cases is just plain wrong. This group of people share some interesting attributes that lead me to believe they would be able to provide sage advice. First they are all elders of our society. They have been around a bit. Second they all have professed a strategic vision of what could and should be. They have, as I have said, a systems perspective, meaning that they see the interconnectedness of all things. And they know everyone else in the various fields who could contribute. They have access to massive intellectual resources that it will take to make sense of what is happening to and in our world. I would ask this group to meet and start formulating definitive frameworks for defining and resolving these issues. I would ask them to approach this from the perspective of the best available science and not on the basis of what would sell politically. I would want to know what the best minds on Earth understand, no matter how devastating the news might be. We need to know the truth. If I were Mr. Obama, I would recognize the need to assemble wisdom and insight. I would put emphasis on the scientific world view because that is the only way we are going to grasp truth and reality. The time for politics is at an end. The time for rigorous understanding of how the world really works is at hand. He cannot rely on conventional wisdom, because, as we are seeing the conventional wisdom cannot provide answers. Now, the question is, will Mr. Obama see this. The world is in deep financial and economic trouble. Even Alan Greenspan (in this New York Times article) now admits he didn't understand that the Friedmanian and libertarian vision of free markets, unfettered by government regulation, would work to solve all problems was flawed. He was surprised. Perhaps it is time to take a hard look at some of these beliefs that have guided our actions and decisions for so long because things are just not working the way they are supposed to. In fact none of the neo-classical economists can provide convincing evidence for what is causing the current melt-down. They each have their favorite 'cause' and kicking boy. It was the housing bubble; it was the price of oil; it was Wall Street greed. Well that last one at least catches part of the reality. Greed is certainly at the top of many lists. But the real problem here is that neo-classical and market fundamentalist economics simply has the wrong model of how the world works. The accepted model evolved from a beginning not unlike most real sciences (natural sciences, that is) by observing behaviors of systems and positing hypotheses about causes. Where it went wrong is in its physics-envy motivation to advance theories but without a controlled experimental methodology. Thus hypotheses could only be tested by statistical analysis of gathered data from observing systems work. The problem with this approach, as compared with empirical natural science, is that you can't apply hard tests to determine variable relationships and derive causal relations. And as a result, some of the early hypothesis got mentally converted to law-like status, e.g. supply and demand, without any experimental confirmation. Another egregious assumed law was that of rational agency theory. In this case economic agents are assumed to be rational decision-makers who are guided by maximum utility to make the right choices. It certainly made the models easier to work! Growth was a reasonable goal, say, 20,000 years ago when humans were few in numbers and lacked capital assets to make life easier and safer. The urge to grow in numbers, and in capital, is not un-natural at all under those circumstances. But once the world is 'full' of people and sufficient capital to make life comfortable the need to grow is gone and our activities should enter a form of steady-state. Natural growth curves are 'S' shaped, starting out slowly curving upward, gaining momentum upward, but after a while losing momentum and turning flat at the top. They will vary, for example population growth curves will have variations depending on the species and conditions. Such growth curves are admittedly ideal. More often one finds curves that start out as described but due to catastrophic negative effects result in a crash back to low levels. Such curves obtain in population dynamics where a lag time in a major negative feedback loop, such as population expansion of a major predator, allows a population to overshoot, but quickly brings it down. Growth of GDP is a joke. First off, GDP is a miserable measure of well-being (c.f. this criticism). GDP includes such services as rebuilding after a tornado, completely missing the point that we are repairing damage to the system — how is the damage a positive thing? Herman Daly has pointed out that fallacies associated with GDP as a measure of income. Secondly, any meaningful growth, measured in dollar denominations, has to be adjusted for inflation. And the official government methods of calculating inflation, e.g. the Consumer Price Index (CPI) have been fudged and changed in ways that under-report inflation and over-state GDP. It isn't even clear that the economy has been growing at all for all these years (R. Reagan, G. Bush senior, Clinton, and G. Bush Jr. administrations). One wonders when most households require two earners (or one earner working two or more jobs) just to make ends meet. What about growth of job creation? More jobs mean less unemployment, right? But look at the jobs that have been created, and starting even before globalization allowed shipping manufacturing jobs overseas. The biggest 'growth' in jobs has been in the 'service' sector. And this is a euphemism for grocery clerks and restaurant workers. Yes a few jobs in the glorious banking and finance services business were created; we now realize they were high paying jobs for people who created an illusion! But those few jobs could not compare with the jobs in the grunt work sector of the sector. The real question isn't growth of jobs, but quality of jobs. How do jobs permit people to live comfortably and safely? They don't. Yet every economist, every politician, and every citizen dutifully and in knee-jerk fashion focus on growth of the economy as the indicator of well being and health of the nation (world). All this is a good way to not focus on the two problems that really matter: population growth creating demand and the growing disparity between the haves and the have-nots, between the super rich and everyone else. I suspect the super rich want to keep us thinking about GDP growth so we won't notice that they are absconding with all the real wealth leaving the rest of us poorer every day. We won't make any progress in solving our problems as long as we keep this insidious belief that growth is good. It isn't good any more. We've over-grown in every respect. The world population and the average per capita ecological footprint exceeds the carrying capacity of the planet now. If anything we have to shrink the population. We also have to shrink the disparity between the rich and poor. But that will take questioning a number of other dearly held beliefs and finding them wrong. For example, the rich have a right to be so rich because they are the ones who generate the capital (capitalism as practiced in the West). They take the risks and reap the rewards. They are the smart guys who figure out how to make profits. Why should we question this assumption? Well, Enron, Global Crossing, Bear-Stearns, Fanny Mae & Freddie Mac, Wall Street; shall I go on? We should question it because it is destroying our world. Another belief we have to question is that human happiness comes from the ownership of stuff or the ability to command resources to pamper our desires. Everybody wants stuff. But stuff being produced is exactly what is generating CO2 and warming our planet. It takes gobs of energy to produce stuff. And the only place we are getting that much energy is from coal and oil and natural gas — the fossil fuels we burn. No other energy source comes close to providing what our fossil fuel infrastructure provides in terms of the power needed to drive our economy as it is currently constituted. Self-centered, and self-important people who want to have stuff and more stuff rightly perceive that if we truly want to reduce our CO2 emissions we will have to stop — yes stop — our production of mere stuff. We should be using our fossil fuels to build up a carbonless energy infrastructure (while at the same time reducing our population to one that could be sustained by the lower power alternative energy sources). We should not be building more iPods and cell phones (throwing away the old models as they are not up-to-date enough). We should be willing to sacrifice a whole lot of amenities in order to save capital for our children and their children. We should, but I seriously doubt we will. Beliefs are hard things to throw away, even when the evidence says we should. The vast majority of people are, sad to say, not very wise. And as long as the majority of humans are Homo caladus and not Homo eusapiens, we are pretty much doomed to keep on believing in bad ideas. I will continue to question the beliefs in our system, as I have in the past. Capitalism, democracy, and a host of other dearly-held beliefs don't seem to be working for us. What is wrong? But I don't want to abandon the effort to think about what could be; what humanity's strategic plan should be. Knowing what is wrong with the way we believe now is going some distance to understanding how we should do things differently, and what a closer version of truth is. We need to understand our situation if we are to find a way forward. I've just returned from a meeting at the State University of New York (SUNY) Environmental Science and Forestry in Syracuse, New York. The purpose of the meeting was to discuss a new kind of economics, a real science of economics. Truthfully, it isn't the first attempt to reconcile economics with a more scientific methodology. Nor is it the first to try to start from a scientific (natural sciences, that is) basis in theory. In fact it appears to be derived from, or expanded from ecological economics, the approach you might have read my enthusiasm for in prior posts. Indeed the main proponent of biophysical econ was a student of Howard T. Odum and has worked with the most prominent ecological economists (e.g. Herman Daly and Robert Costanza). Charlie Hall is one of the most active researchers pursuing the concept of energy return on energy investment (EROI). He has had a major series of posts on the Oil Drum (thanks to Nate Hagen) in which he demonstrated the concept and then applied the analysis to a number of energy production systems. You should read his series to learn about this important concept. Start with the last link. Briefly, EROI attempts to produce a net energy calculation; after you account for all of the energy inputs required to produce an energy flow to society you have to subtract the inputs from the output to determine the return on the energy invested. EROI is actually a ratio of energy out for energy in. So, for example, if we were to add up all of the energy used to manufacture solar PV collectors and associated installation equipment, including the energy used to mine the raw materials, labor, transportation, and so on, it needs to be considerably less than the energy produced (measured in common units like Joules). Or otherwise we are not ahead in energy for the whole world. The energy output is measured over the effective life of the collector, so in principle we should have a large positive EROI. An EROI of 10:1 is probably needed for any energy system to have an effective return. This analysis can be applied to any energy supply system. Most famously Charlie has done a lot of work on oil. Since there are a huge number of factors involved in oil as an energy source, like oil quality, it has been a daunting task and still needs refinements. You can estimate how much energy it takes to manufacture and install an off-shore platform reasonably well. But then what about the energy that went into producing the manufacturing facilities to build off-shore platforms? To be technically correct you have to look at energy inputs all the way down to that used to grow the food used by every worker who had a role in producing the final product. This means exploration (amortized, of course), drilling, pumping, shipping, refining... Well you get the picture. Our energy infrastructure is unbelievably complex! Yet everything feeding into the production of oil and its products takes physical and chemical work and requires energy. Thus there is a net left over for use in our cars and homes and factories. The problem is that the net has been getting less and less over the last 100 years. It has especially been declining since the 70's when we really got into off-shore and unconventional sources. An oil rig on land requires much less support equipment, and hence less energy. But today we are chasing oil in all quarters, some very difficult areas with associated high energy costs to retrieve the oil. Whereas oil EROI was estimated to be around 100:1 (one hundred barrels out for each barrel of oil used to retrieve it) in the early 1900s, it is now estimated to be closer to 15-20:1 today for imported oil and around 30:1 as an average world-wide (see Charlie's 'Balloon diagram'). The reason we haven't noticed this decline is because until the 80's we were always bringing more oil resources on-line, enough so that the final result, more oil to meet demand, masked it. Then gradually we brought less and less until 2005 when it now appears the world production of oil reached an effective plateau. The EROI decline is actually reflected in monetary costs and monetary returns on investment. The oil companies and nation began to feel the decline as an apparent decline in return on money invested — first in exploration then on punching new wells in old fields. Oil is a finite resource and as anyone with high school algebra will know, if you use up a finite resource there comes a time when it pays diminishing returns. We have hit peak oil, not because we have run out of the stuff underground, but because we've run out of incentive! That brings us back to economics. Neo-classical economics is a theory looking for support and it is basically a bad one. It doesn't take physical reality into account, like when you used up finite resources (its theory of substitutability says so what!) there will always be a substitute. But this is proving to be wrong. Ecological economics does a better job. It embeds the human economy within the ecological systems of Earth. You have to pay nature a price for its services like raw energy supply and absorbing our wastes. Then the market will play its role in allocating resources appropriately. But by Charlie's reckoning this isn't yet enough. Energy is a far more compelling consideration than even the ecological economists have taken into account. Hence biophysical economics. I'm not really wild about the name. The biophysical part is OK. But I'm concerned that by calling this new science a kind of economics it will do two things that we wouldn't want. First it will irritate the neo-classical guys (maybe even some of the ecological guys) and they might do to biophysical what they did to ecological and evolutionary economics (yes there is a school of that too), namely ignore them and brush them off as fringe nuts. The second thing it would do is scare the very people whose support is needed to push a change in perspective on the politicians; everyone else. It would do so because if they even got a glimpse of the results (like EROI and peak oil) they would not like the implications for our fossil fuel-based consumption party. The party would be over. I would like to see a wholly new nomenclature that puts emphasis on the systemic nature of the study, but that is just me. We'll see who salutes it after running it up the flag pole. My own contribution to this meeting was to present a talk on my Money = Energy thesis. The Powerpoint presentation slides are here for anyone interested. I think the talk went well. It is hard to visualize how standardizing monetary value on energy can be done, by people used to thinking about fiat money and regular economics. But as some of you know from reading my prior blogs, it has a ring of truth to it. Most of the folks at the meeting were nodding their heads on most of my points about why we should have an energy standard for money. A lady from the hedge fund industry preceded me and gave a talk devastating to the whole notion of fractional reserve banking and higher orders of phoney money (M3, M4,... etc.). It was a great entre for my talk because I pointed out that not only is this debt crisis due to no one knowing what anything was worth anymore, but that what we've been borrowing (against the future) for is to produce toys and big houses. It wasn't even like we were investing in real wealth generating capital. Then I argued why it would have been impossible to have made such stupid decisions if we had had a firm, and physically realistic, standard for money. The economic signals of cost and price would have really performed their informational role. In the final series of slides there is a series of arguments that were meant to counter those of one of the world's foremost energy and its social meaning experts, Vaclav Smil. He has argued in his book, "Energy in Nature and Society," that it is nearly impossible to have an energy basis for money. But I just don't think his arguments are very strong. It's probably a fool's game to go up head to head with the world expert, but I thought I would give it a shot. You never know. An energy standard for money (and you can read back in some of the blogs to see this argument) would have done something that gold did for money in days gone by. You couldn't create it out of nothing. A stock of energy (ready to do useful work - after EROI was taken into account) is definitely measurable. Even with measurement error it is still relatively easy to account for. Bankers and greedy people cannot create money out of thin air when the money is tied to real value. This current crisis would not exist had we been on a standard basis for our currency. I'm not sure where this new science/perspective of how the economy really works is going to go, but I will be working on my own contributions to it, regardless of what it is called. Charlie and his comrades are on to a lot more truth than the fellows from Chicago ever imagined in their philosophies. I'm going to be off for a few days this weekend, so won't be working on another posting until next week. I'm going to meet with experts in biophysical economics. This is an exciting shift for me. I have been working for the last few years to understand energy as a basis for our economic system and these folks are at the top of that area. I look forward to learning a lot! What I am hoping to discuss with them is two related areas. The first has to do with my computer-based modeling of the energy system sustainability criterion. I've mentioned this several times here and especially on the NYT Dot Earth blog. The second topic is also something I've commented on here, in semi-technical terms. And that is the relationship between money and energy. Or at least the relationship that should exist. I'll file a report on the meeting and what I gleaned from it when I get back. Have a good weekend all. The stock market roller coaster ride has been wild. Several analysts I read (and tend to trust) claim that we can expect more next week. Some pessimists are expecting the markets to take a huge nose dive. As I write this Bush is hosting a meeting between the developed world's finance ministers as they attempt to coordinate a global response to the credit freeze up crisis. Moreover, Henry Paulson is expected to announce the use of capital infusion into the banking system through equity instruments as part of the bail out. This is something many economists wanted from the beginning. Better late than never, I suppose. Of course, I wonder where the US and other governments are going to get the money? The US is already in hock up to its ears. Are they going to borrow more money from the Chinese so that they can help the banks loan more money so that more consumers can consume? Does that sound like a wise thing to do? The price of oil has come down quite a bit as a result (supposedly) of demand destruction in the slowed economy. At the same time OPEC is discussing reducing production in order to stabilize the prices where they prefer them (~$100/bl). High oil prices are now recognized as a major contributor to raising inflation rates when increased costs of energy get eventually passed through to customers of products and services. So prices coming down might provide a little relief in that area. But I suspect what we will see is the same kind of volatility in the oil prices as we see in the stock market. Down one day, up the next. The 'experts' are pointing in every which direction to explain what is happening. The housing bubble, sub-prime mortgages, Reagan-philosophy and deregulation of credit markets, now its confidence, etc. are all candidates for the 'cause'. But as I wrote last week, these are just triggers and amplifiers. The real underlying cause of the deflation of the credit markets (in all their clever forms) is that we can no longer do the amount of useful work that our economy requires just to maintain. Our credit markets have been based on expectations of wealth production in the future. And, as I have explained, real wealth isn't more iPods. Real wealth is in infrastructure and especially an energy infrastructure. We can no longer put our energy and efforts to producing real wealth because we spent our windfall from fossil fuels on trivia. I hope we had fun with our SUVS (especially Hummers), our theater-sized TVs with satellite-provided 2,000 channels of infomercials, our NASCAR weekends, and such. Because now its time to pay the bill. Only, look here, there is no money to pay with! We borrowed from the future. We fully expected to go on growing the economy and producing more stuff in that future. Now, with peak oil and decreasing energy return on energy investment (EROI) we have less and less energy to do anything worthwhile. There will be no future production of enough wealth to pay back the loans. All of those experts were completely oblivious to the true nature of economics. Up until the s**t hit the fan they mostly thought everything was just fine. Worse yet, the majority of the country are still believing we should be able to have our toys and be wealthy too. Mainstream economists are still preaching the wonders of capitalism, consumer-based growth, and markets. Meanwhile the 'masters of the universe', bankers and traders, are breathing a sigh of relief that they may yet keep their estates in the Hamptons. Most people actually believe that we will get through this little problem and one day, when confidence returns, we'll get back to normal and go on happily producing more junk and consuming. Bush and his team of 'experts' are doing their best to guide us back to that happy, mindless, world. But there is nothing they can do to make it so. We were just too leveraged relative to our future capacity to do useful work. Nothing short of a breakthrough in cold fusion is going to make this any different. If people were capable of recognizing the relationship between energy and the economy they might also realize that the only way forward would be to radically change their lifestyles and expectations. I'm not talking about a few conscientious souls planting organic gardens and getting off the grid, though I applauded their example. I am talking about a global move to sacrifice our trivial productions and get to work on things that really matter. A global-scale WPA style effort to build solar and wind farms, not to replace fossil fuel power plants to feed our consumption, but just to have enough electricity to salvage some form of civilization for our children. We have to give up eating oranges and tomatoes in mid-winter. We have to shut down most of the entertainment and sports industries. We have to re-localize our work, education, and agriculture in order to save fossil fuels to help bootstrap a new steady-state economy based on renewable energy sources. But here is what is more likely to be the scenario based on the simple fact that most human beings have low levels of sapience (the reason we are in this mess in the first place). People won't believe they need to make sacrifices. They will continue to listen to the 'experts' talk about how it will get better if we just believe in the wonders of capitalism. And foolish people do want to believe. So our financial meltdown will result in many companies being unable to borrow money just to meet payroll. They will shut down, meaning that their former employees will not have money to pay their bills, their debts, and most of all, to buy stuff. The loss of customers will cause yet more companies to shut down, And the whole thing will snowball into a depression that will make the 'Great Depression' look like a holiday. But here is the difference between the Great Depression and what we will see. We will never recover. During the Great Depression the production of fossil fuels actually increased, building a surplus of energy ready to be put to work. All it took was a world war to kick start the production wheels. Even had there not been a war the world would have recovered eventually. The energy was there and all that was needed was finding methods to couple the reserves with useful work. The war just lubricated the coupling so that energy could flow through again. Peak oil means that there will be no such build up of reserves. We are on the downward slide and have already borrowed egregiously against presumed future energy (actually believing that future energy would be MORE than current flows). So, if we slide into a depression we will literally end up giving up all that I indicated above, not by willing sacrifice, but by virtue of the depression state. With the consequence that we will not have invested what energy we have left into building a basis for a future energy production system. Consider what will happen if we are just paying attention to monetary costs of alternative energy systems as compared with the price of oil. This is the analysis currently used. As oil prices come down investments in wind and solar will not be made under the market and capitalistic enterprise system. Such investments will be relatively too expensive and have no obvious payoff. So, while our great captains of industry focus on dollar return on dollar investments we will fritter away every possible option of building out a sustainable energy system. When I think about this waste of humanity through its own foolishness I sometimes feel disgusted. But then I remind myself that humans haven't got the neuropyschological machinery needed. We are not a really sapient species after all. Its really not our fault! We are sapience-retarded compared with what we need to comprehend the meaning of what we are doing to ourselves. Somehow in evolution we just ended up with an imbalance between cleverness and judgment/foresight. However, sapience, like intelligence, is distributed unevenly through the population. There are individuals with above normal sapience, even extraordinary sapience. My hope is that many of these people are wise enough to survive the increasingly likely downfall of Homo sapiens, or as I prefer Homo calidus, man the clever. I dedicate my thoughts on Sapient Governance (which I hope to get back to in these blogs soon) to those survivors. They will devise a civilization based on governance principles from nature and not be so full of hubris about their own capacity to just invent governments and economies on their un-principled assumptions. On the debate - or a portion of it. Score one for Obama. When asked what his number one priority would be in the face of the financial meltdown and $700 billion less to work with in the budget, he answered "energy". Of course, I suspect he meant finding any and all non-carbon sources of energy to replace the carbon-based sources, particularly oil, that our economy depends on to run at the level it has in recent years. He seems to understand that energy is the fundamental basis of economics and particularly growth. Perhaps the non-carbon focus is a nod to climate change. And that is certainly a worthy joining of the two issues. But the 'solution' is infeasible when you are trying to solve the problem of economic growth as a primary objective. It won't work. I've alluded to the impossibility of deriving enough net energy to do useful work from alternative sources in some of my prior postings. Even nuclear power would be unscalable in the time frame we need to be acting. And in spite of the numbers quoted for the amount of sunlight that falls on (half) of the Earth each day, the fact that sunlight is diffuse (you can walk in it without getting crisped instantly - try walking through the fire pit of a boiler) means that converting it to a form, say electricity, that is useful means covering truly huge areas of land with concentrating collectors or movable mirrors. The same argument goes for wind power. In spite of the wind resources that people are quoting, the actual build-out and infrastructure needs to support wind (like batteries) means that we will not be able to use those resources to any great degree. The problem that everyone wants to solve is the wrong problem. 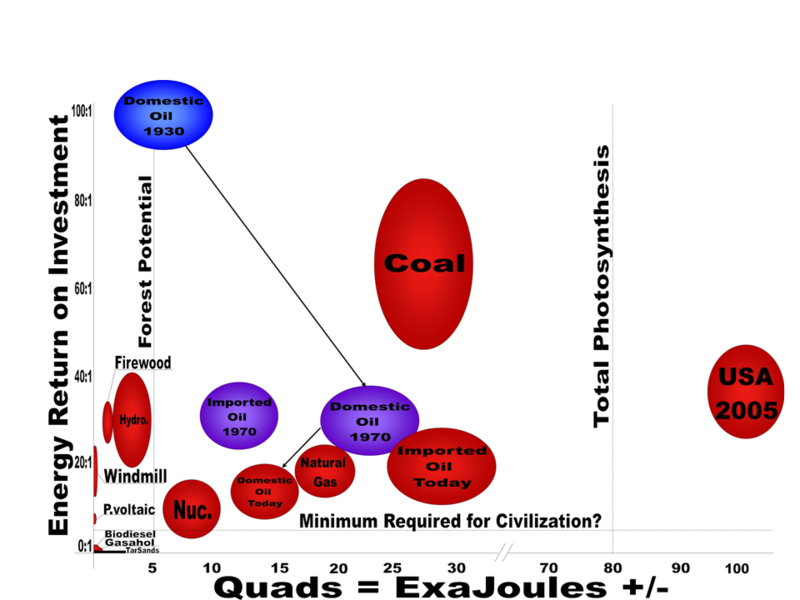 The problem of supplying sufficient alternative energy to an advanced civilization can only be solved if 1) we begin immediately to radically reduce our wastage of the energy we have — stop building toys and providing entertainment services to the extent now done, and start working on efficiency gains where the greatest leverage can be had; 2) we start on a population growth control program that will reduce, not just stop growth, the size of the population over the next hundred years or so, humanely of course. I don't know if Obama or any of his advisers actually understand this. It is obvious that in the present anti-intellectual, anti-truth climate (denial) in the US, no candidate can level with the American people even if they did understand the severity of the constraints on our civilization. But I don't really think that they see it this way at all. Our politicians are so schooled in the belief in capitalism, growth by consumption, and the nature of wealth as money, that they are probably unable to see reality in any meaningful way. It looks now as if Obama has a really good shot at becoming the next president. I will certainly be voting for him in spite of my earlier tirades. Since he has indicated energy is the number one priority (and I certainly agree) and if he follows through with a broad spectrum, research agenda, we may yet discover the problems with scaling early enough to realize our mistakes in thinking that we can just change to alternative energy and get on with consumption and growth. Also, even though there will be much pain and gnashing of teeth from the combined financial problems and the reduction of energy flow through due to peak oil leading to what I suspect will be contractflation (otherwise known as a depression), in a way this might be an overall good thing in that it will slow us down. We will burn less carbon and conserve fuels against the day when we need them to build out the actual energy infrastructure that will serve society. We will still need to figure out what to do about population growth. Again, I hope I am really wrong about this prognostication. In my day job I continue looking for answers to disprove my worst fears. Could the financial bailout work? I've been listening to news analysts and their 'experts' all day and getting quite irritated. The experts are the ones who got us into this mess. Why on earth would we turn to them to explain it, or get us out of it? The problem defies ordinary economic/financial explanations. There is something far more fundamental going on and the economists and politicians simply don't get it. OK the administration used the wrong terminology in the first place. It isn't a bailout, it is a rescue. The government proposes to buy up the so-called toxic assets held on the balance sheets of many banks. One of the more 'creative' justifications for this approach is that then the US taxpayers will 'own' these assets and that eventually, when things get back to normal, those assets will once again be worth something. The government can then sell them off, at least breaking even if not making a profit. All well and good except for one thing. Things won't be getting back to normal. As I have explained, real capital is the hard assets in our economy that either make it possible to obtain more energy, making it available to do useful work, or increase the efficiency of using energy, thus conserving it for other useful work. Over the past several decades we have used our energy flow to build toys and diversions and wasteful machines. We've used it to build bigger houses than we really needed. We've been on an entertainment spree, channeling a dwindling resource — fossil fuels — into things that make us feel happy, or at least make us feel like they will make us happy. Meanwhile infrastructure has crumbled, manufacturing has gone overseas where cheap labor can substitute for capital improvements in manufacturing processes, and in response we started making credit available to anyone breathing. We had to do the latter. People inherently think that things are going to get better. They believe a day will come when the good jobs will come again. They go back to school thinking they will get a high-paying job with more education. They need to believe in the future. So they rationalize borrowing money to buy consumer goods. The money lenders were all too happy to enable this behavior. They, it turned out, were borrowing from other money lenders. And everyone was borrowing against the belief that housing prices would continue to rise. Beliefs are not our friends sometimes. Meanwhile the government is telling everyone that consumer spending is what is keeping our economy strong and growing. I've already written a good deal about the idiocy of believing a growing economy is a good thing. Sure it 'creates' jobs, even if those jobs are flipping hamburgers. But growth for its own sake is just plain crazy. I honestly have difficulty understanding how any educated person could believe that growth can just keep going on forever and ever. Of course, the way the government justifies this is based on a huge fallacy. The Gross Domestic Product (GDP) is a monetary measure of, well actually it is a lie! I won't go into the details here, but GDP is a bogus measure of anything, including economic health. Put simply, the GDP had been growing somewhat but anybody who had to pay the bills would realize that life was not getting better. The economy has not been strong. The President lied or was incredibly naive when he told the American people that it was. It has been in decline since the 1970's, believe it or not. Even in the so-called Clinton miracle years (remember, just before the dot-com bust) when high tech soared, it was an illusion. Even then globalization and increasing pumping of oil made it seem like everything was rosy. But it wasn't. Hidden beneath the surface of dollar economy measures was the fact that the energy cost of getting more energy was in decline. Remember it is net energy available to do useful work that determines how much real work can be done. Real work, meaning building capital assets, would have included repairing the infrastructure and developing an new energy base (if that is even possible). It never happened. And as net energy continued to decline (even as volumes were increasing) the real basis for wealth building frittered away. And real assets frittered away with the decline. What to do? The economy was already heading toward a consumption-driven mode. Ever since WWII ended and the national policy that everyone should be able to own a home (and then cars) the idea that we should be able to borrow against the future to enjoy life now has taken center stage. With the advent of consumer lines of credit and credit cards we moved more to the notion that we could buy all sorts of things and pay back later when we were, ourselves, making more money (remember we were supposed to be in a growing economy - a high tide lifts all boats, and all that). As long as it looked like there was more money available this party-on mood seemed justified. The banks and other Wall Street geniuses had a nifty way to make it all work. They would create a new kind of asset (or at least something that was like an asset for accounting purposes). They had, for a long time, been in the habit of lending from their deposit reserves. They would lend small percentages to people who had a compelling story about how, if they just had a grub stake they could bring in more dough (like gold mining). A prudent banker would loan to those that seemed reasonable risks, but they charged interest to cover their other risks and for profit. All well and good. And most local banks still try to be prudent in lending. But the big Wall Street boys had a better idea. Theories, like portfolio management, suggested that there are ways to combine varying qualities of risk into paper instruments that were, in theory, backed by real assets. If one risky venture didn't pan out, the risk was spread out over enough other ventures that the pain was minimized and if all the others came in, well profits were to be made. Also, the notion that the level of risk taken should correlate with the expected returns prompted some to take higher risks on because it meant higher profits. Greed is good according to modern capitalism, right? Some kinds of banks have apparently been using deposit reserves to buy hedge funds and mortgage-backed paper. Perhaps that seemed prudent at the time. But mortgage lenders were busy getting house appraisals boosted, because their cut would then be more profitable (greed again) and finding customers who were, well, not really qualified. So, lo and behold, all those banks were buying paper that was valued poorly. And they were rushing into it. Fractional reserve banking had turned into a money grab. Everyone in the financial sector was going to get stinking rich off these creative forms of 'capital'. Meanwhile, oil started approaching the peak of production. Jobs had been shipped overseas. People were borrowing to support consumption. And the whole house of cards came tumbling down when oil prices started moving up. Sure investors taking their money out of financial instruments may have caused a spike in oil prices, but the overall trend had already been established. The relationship between money and energy was starting to reveal itself. Inflation, which always comes shortly on the heels of energy price rises, started to become a factor. Now I tell you real money is really energy. And the energy flow is starting to tail off. And all hell is breaking loose because no one wanted to believe this simple fact. Fractional reserve banking, borrowing for consumption, and subsequent money-creation schemes like derivatives, is a violation of the first law of thermodynamics. Energy (money) can neither be created nor destroyed under ordinary circumstances (non-E = mc2). You can't just create seeming money out of nothing that has any real meaning. If you are going to borrow from the granary there had better be some grain from last year's harvest in it. You can't borrow food that hasn't been grown yet. And now, thanks to the second law of thermodynamics, which tells us that every time you use energy some of it is lost doing the work, we are faced with having used up our easy, energy-cheap energy on toys and cannot produce the energy we require to pay back the supposed loans. The bank of oil and coal that we have been borrowing from is running low. It takes more energy to get energy out of it and so we have less energy to do truly useful work. In other words we are screwed. The banking crisis will unfold as the greatest loss of money ever. But it isn't real. There never was any true wealth represented in that second- and higher order illusions of money. It was always a scam. No matter what kind of bail out, or rescue plan is tried, nothing will save the 'financial' industry in the end. It was all a great pile of foam, no substance. Meanwhile we have little real capital to fall back on. I suppose you want to know what to do about it. That is the sad part. Everyone is looking for a way to save the banking system and believing things will get back to normal. But that won't happen. Normal wasn't reality. Reality is that you need energy to do work. Reality is that without a sufficient flow of energy you cannot do as much work as you might like even if you eek every last bit of efficiency out of what you are doing. The solution is to abandon our notions about economics and growth that have deluded our vision. The solution is to call upon all citizens to recognize that reality and prepare for substantial sacrifices as we try to work our way out of this conundrum. We need to channel every possible bit of fossil fuel energy into the production of an alternative energy infrastructure. We need to recognize that we will never replicate the energy flow that we have enjoyed over the last hundred years with alternative energy sources. We will have to manage population so that we eventually shrink it to a sustainable level commensurate with the actual energy we are able to produce. Unless our leaders begin to show some gumption and start telling the truth, and start us down this path, there will be nothing left to salvage.